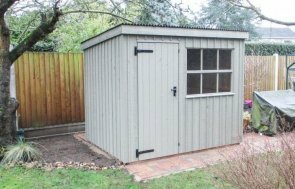 This National Trust Peckover Garden Shed has recently been installed in our customer’s garden in Carshalton, Surrey to use as garden storage. 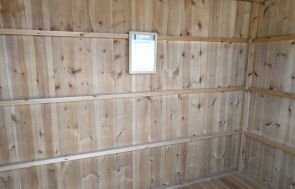 The size of this Peckover is 1.8 x 2.4m, which is the smallest size we make. 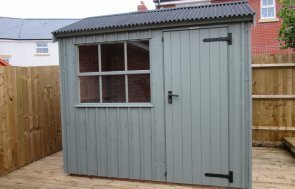 This is so that the shed will fit comfortably in the customer’s small garden, without it taking over the whole of the available space. The Peckover has got an apex roof, coated in a black corrugated roofing material, a single door in the front gable end and a set of traditional Georgian style windows in the right-hand side. There is also black cast iron door furniture on the door, including the hinges, rotating door holders and a door handle with a mortice lock. The vertical sawn boards for the cladding add to the traditional feel of the building, as this was the style of the outbuildings that the National Trust range was designed on. The colour of this Peckover is Disraeli Green, a pale green colour that is one of the six natural looking National Trust paint colours that you can choose from with the range. If you like the look of this garden shed and would like to see the building for yourself, you can visit one of our seven show centres across the country where you will find the whole National Trust range (four Garden Sheds and four Summerhouses) at any one of them. If you would like to speak to one of the team regarding your own requirements, you can contact us, receive a callback, or you can call us on 01760 444229 to talk to a member of our helpful team.